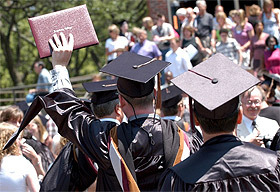 On Sunday, June 29, Augsburg will hold its second commencement ceremony of the year, which will recognize bachelor’s and master’s degree candidates in the Augsburg for Adults undergraduate and graduate programs. Students in Weekend College, Rochester Program, United/Mercy/Unity Hospitals Program, Master of Arts in Education, Master of Arts in Leadership, Master in Business Administration, Master of Arts in Nursing, and Master of Social Work programs will be honored in the ceremony. For more information go to www.augsburg.edu/commencement. Students line up in the Christensen Center lobby promptly at 10:15 a.m.